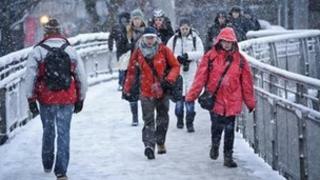 A heavy band of snow has been making its way across the UK, leaving some schools shut and causing travel disruption. So what are your rights if you can't get into work? I couldn't get to work because of the snow. Can my boss dock my pay? According to the employment advice and conciliation service Acas, in the majority of cases, you are not automatically entitled to be paid if you cannot get to work. But that does not necessarily mean you will lose out. Both Acas and the government advice website Gov.uk suggest trying to come to an arrangement with your boss that you are both happy with. Your employer may agree, for example, for you to make up the time at a later date, go to another workplace, or to work from home as far as possible. However, they are not obliged to do this. There are some exceptions, however, and some workers may have a right to be paid. Some employers may have it written in staff contracts, or have a collective agreement in place, that they will pay you if you cannot get to work due to circumstances beyond your control. In this case, if the employer does not pay you, and deduction could be considered unauthorised . You are entitled to a minimum notice period before you have to take the leave. The law states that you must be given warning that is the equivalent of twice the length of the leave. So, for example, you must be given two days' notice if your employer wants you to take a day's leave. However, that does not apply if you get more leave than the statutory minimum. If you get more than the legal minimum of 5.6 weeks a year, (typically 28 days), including public holidays, then your employer can compel you to take leave without giving you any notice. The situation is different again with unpaid leave. He or she would need your permission to deduct the money from your pay packet. But the official advice is you may want to accept this offer as a show of good will - it could also be better than having to use part of your holiday entitlement (see above). My workplace is closed. What then? In these circumstances, you are entitled to pay. In addition, your employer cannot require you to take the time as annual leave. Don't get the sledges out yet, though. You could be expected to work from home or from another workplace, if that is possible in your job. I can't come to work, not because of travel problems, but because my children's school is closed and I can't get childcare at short notice. You have the right in law to unpaid leave to look after children or other dependents in an emergency. Solicitors advise that a school being shut at short notice is likely to be considered an emergency. Therefore, you would probably be entitled in law to a reasonable amount of time off to make alternative arrangements. What would be regarded as "reasonable" depends on individual circumstances, Acas notes. My boss is really unhappy and I feel under pressure to try to get in. The Acas advice is clear on this. "Your employer cannot force you to attempt the journey." The material is for general information only and does not constitute investment, tax, legal or other form of advice. You should not rely on this information to make (or refrain from making) any decisions. Links to external sites are for information only and do not constitute endorsement. Always obtain independent, professional advice for your own particular situation.